Yesterday, we pointed out that the imminent release of The Dark Knight Rises — now ahhhhh just hours away ahhhhhh from its first midnight showings — has been making some people crazy. First, there was Rush Limbaugh, claiming that Christopher Nolan was manipulating his blockbuster so as to ensure Mitt Romney’s electoral defeat (the parallels between Batman bad guy Bane and Romney’s old company Bain Capital were the primary sticking point). Second, there were the fanboys so angered by negative reviews of TDKR on Rotten Tomatoes that they’d threatened to beat one negative reviewer “into a coma” with a “thick rubber hose.” These guys were so nuts they got commenting shut down on Rotten Tomatoes. So what the hell is going on here? Appropriately, someone has gone to the head arbiter of all things Dark Knight Rises — Chris Nolan himself — for answers. 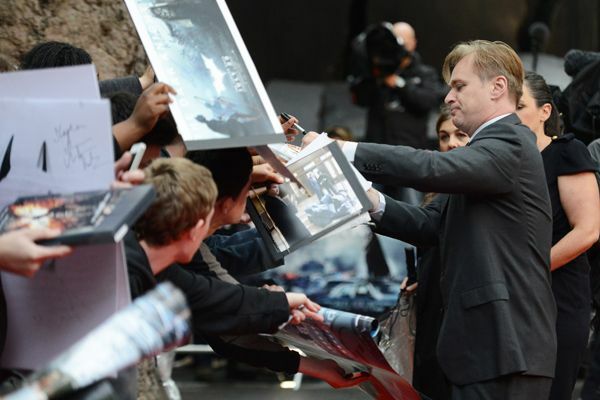 At the London premiere of TDKR, Nolan coolly explained that instantly legendary fanboy reaction: “The fans are very passionate about these characters the way a lot of people are very passionate. Batman’s been around for over 70 years and there’s a reason for that. He has a huge appeal, so I think you know people certainly respond to the character.” Is Nolan saying it’s OK to threaten to beat someone with a rubber hose into a coma because he didn’t like a movie you haven’t seen but are already sure you’re going to like? Well, he certainly didn’t say it’s not OK to threaten to beat someone with a rubber hose into a coma because he didn’t like a movie you haven’t seen but are already sure you’re going to like! Scandalous. This would be a good time to mention that Ain’t It Cool News’s Harry Knowles, king fanboy himself, did — wait for it — not like The Dark Knight Rises. Knowles writes, “Nolan captures majestic imagery from time to time, but mostly it feels like he’s bored with the story and the characters. He and his brother have constructed a film which seems overtly designed to piss off anyone that loves this world and this group of characters.” OK, deep breath, everyone. No one threaten to beat Harry Knowles with anything. Let’s just move on. Right, yeah. What’d Nolan have to say about Rush? “I’m not sure how to address something that bizarre, to be honest. I really don’t have an answer for it, it’s a very peculiar comment to make.” OK, that pretty much sums that up, and brings us up to date. Now let’s all try to not lose our minds for the next few hours, all right?